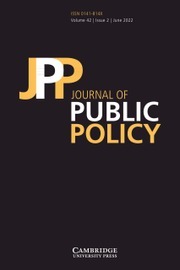 The Journal of Public Policy applies social science theories and concepts to significant political, economic and social issues and to the ways in which public policies are made. Its articles deal with topics of concern to public policy scholars in America, Europe, Japan and other advanced industrial nations. The journal often publishes articles that cut across disciplines, such as environmental issues, international political economy, regulatory policy and European Union processes. Its peer reviewers come from up to a dozen social science disciplines and countries across three continents, thus ensuring both analytic rigour and accuracy in reference to national and policy context.